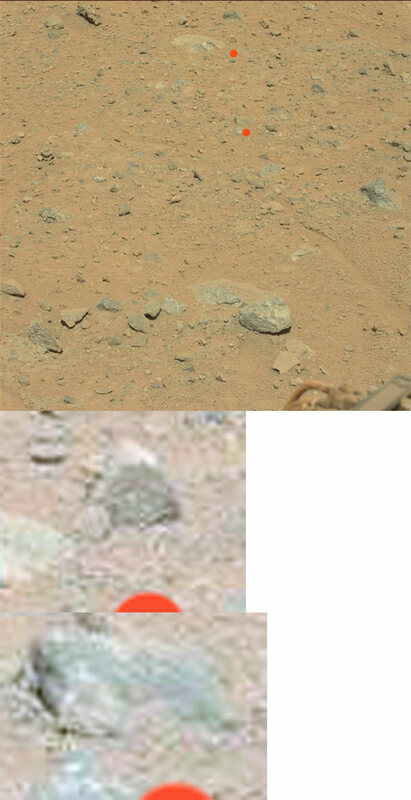 I thought that this was the rover, but the rovers details are foreground, and going by the two open windows, and obvious green, this is more likely a house. 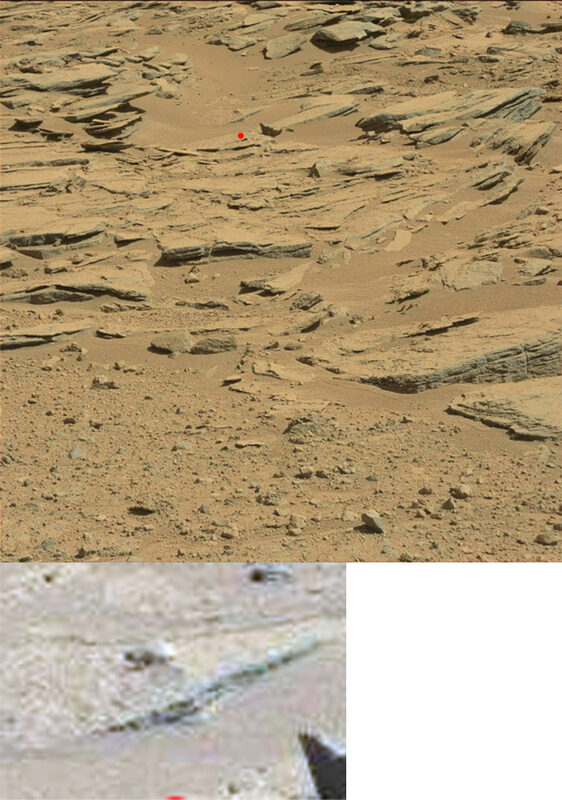 Another real look at Mars, blue distant mountains, trees, (CP shows lime green to grass green) and other green areas. The thing above, is probably the rovers turrent. Did a quick search for some more water drops, (592-640) over just over a month, and there has been rain, but not much. 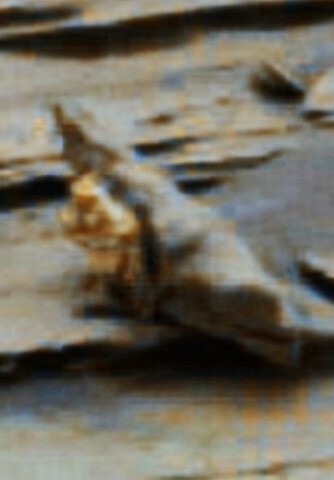 And is showing two drops on the edge of one of the servos, as well as another behind it, (top, right). The wheels are fairly clean, and the dirt isn't that damp, so probably a sunshour. 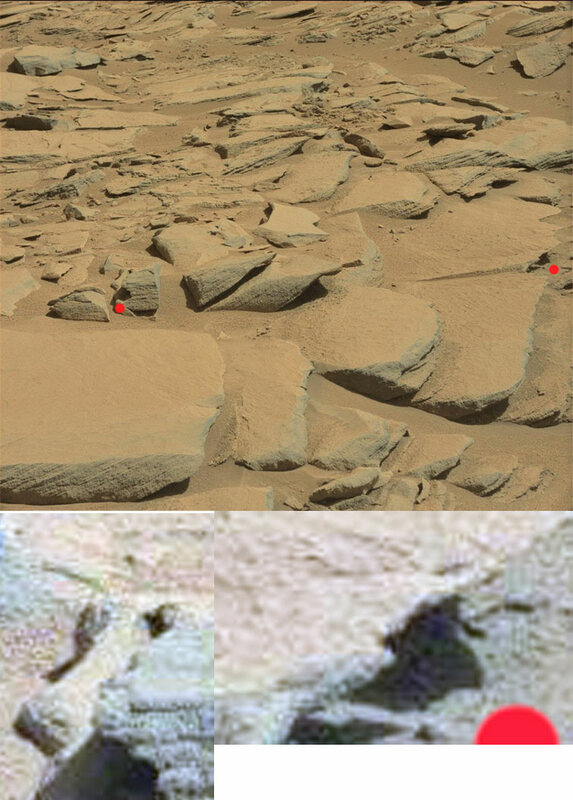 Next one the ground is a lot wetter, (clinging more to the rovers wheel) and shows a likely water drop on the left, (red arrow). The second one doesn't really show it, but it does show one small drop on the laced fabric protective coating on the right hand one, (red mark). So one image 609 Water drop, Sol 630 Nothing, but there is a 21 day gap, so the sun would have evaporated it away. 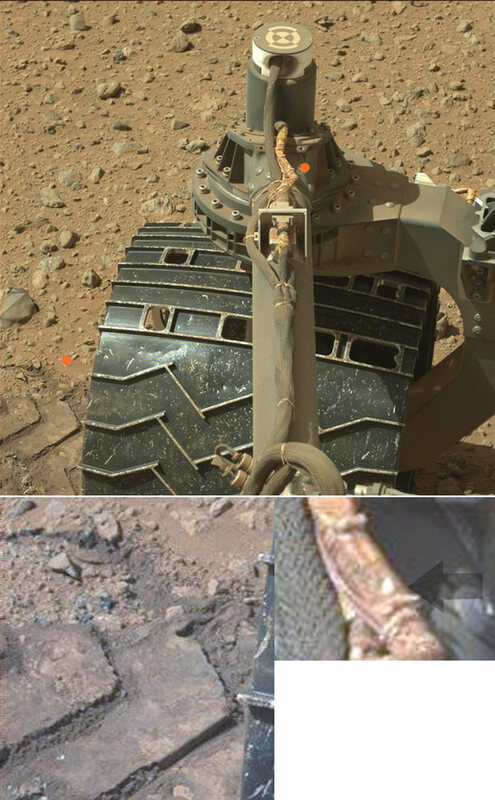 So the rover is driving through wet or moist dirt and other times it is dry, as well as water drops appearing and disappearing, not to mention the green l keep finding. Or in other words, Mars is Earthlike. Rocks? Rocks the like of which you'll never see on Earth, for sure! 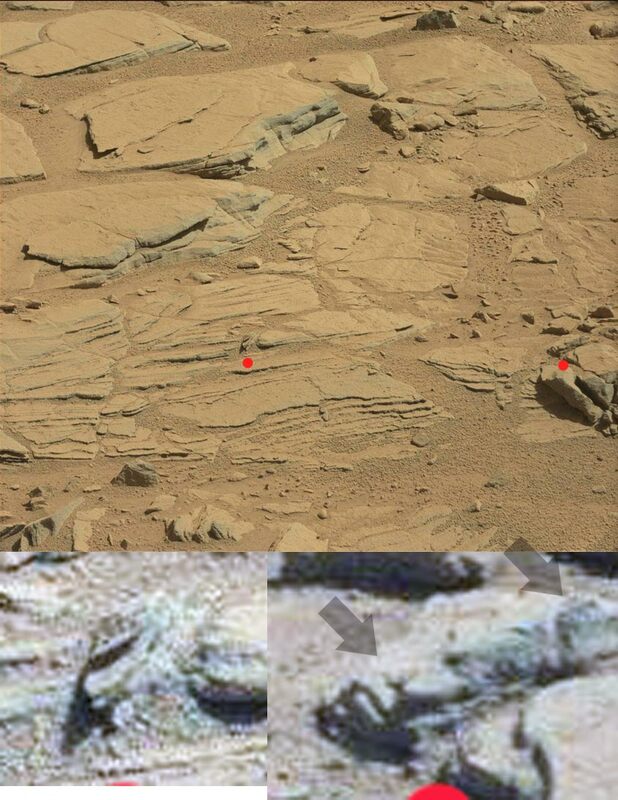 We may have just seen the first fossil evidence of what was life on Mars. If our hypothesis is correct in its interpretation, it means ancient Mars evolved microbial and multicellular life perhaps a billion years prior to Earth. A fresh water lake on Mars 3.5 billion years ago suggests Mars may have been the first blue marble in the solar system, not Earth. Which can also mean that an asteroid hitting mars back then may have starked off life here. That would explain why Mars and Earth share so much of the fauna and flora, and also could mean that any planet in our galaxy with the potential for life, may look remarkably similar. 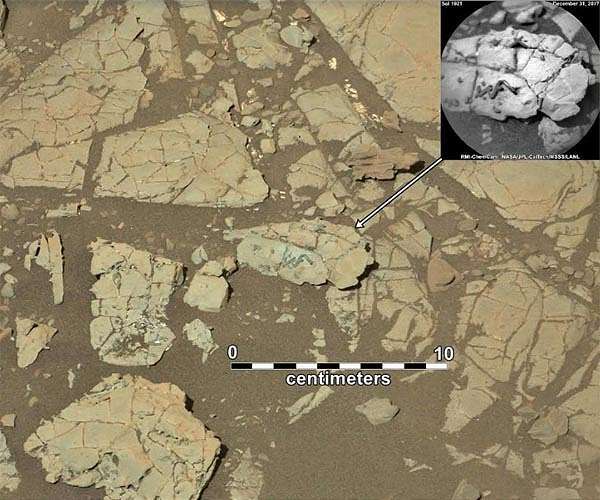 One of the main reasons researchers of Martian images get stumped in finding new evidence, is the human propensity to search for familiar geometric constructs and then try to compare findings to that of structures on Earth. Good but not great. We need to switch gears and look to alien constructs which are not necessarily geometric. 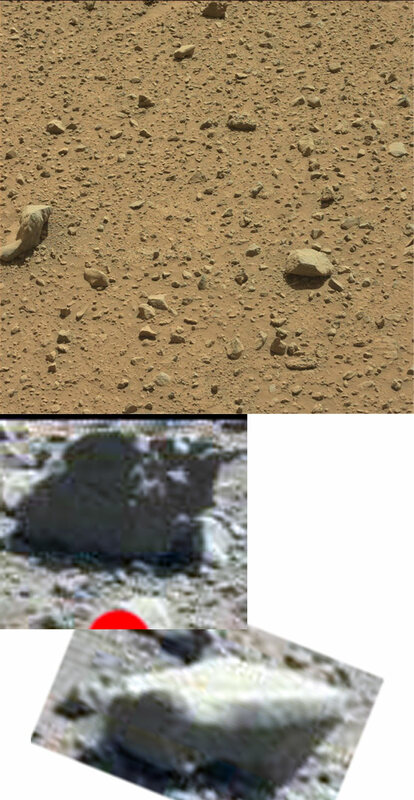 Finding remnants of an ancient civilization becomes productive when we choose to search for "the alien mind". So, I will begin to post some images which I have personally located over five years of research. 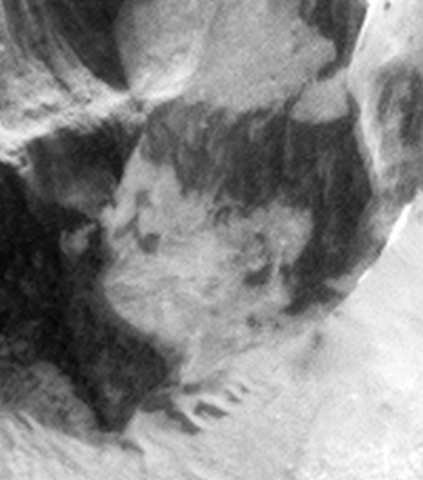 I won't go into much detail of "where" accept for one or two, they will be either from the MRO or Mars Express. If you need more info, please let me know. Have fun....life out there is BIG! Nice images Albion, l have been personally looking at the latest Bennu asteroid images, since it has been reported that alien structures lie on the surface. 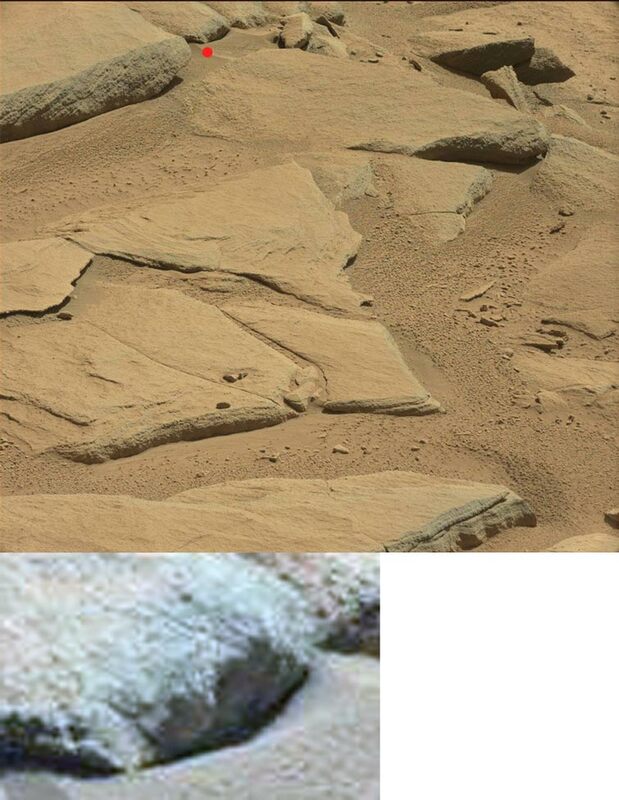 Of course NASA says our mind see's something and makes the rest up, but this looks like a giant canopy, which could have been excavated by someone or something in our past. And NASA is supposed to take closeup images of this asteroid that is not much bigger than the empire state building,....and Photoshop it to death, no doubt. Here's a couple more of Bennu. That "canopy" could easily be tall enough tp fly a decent size craft underneath its lid. Yes, impossible to say that it is 100% proof of something artificial, but it is certainly learning towards it. 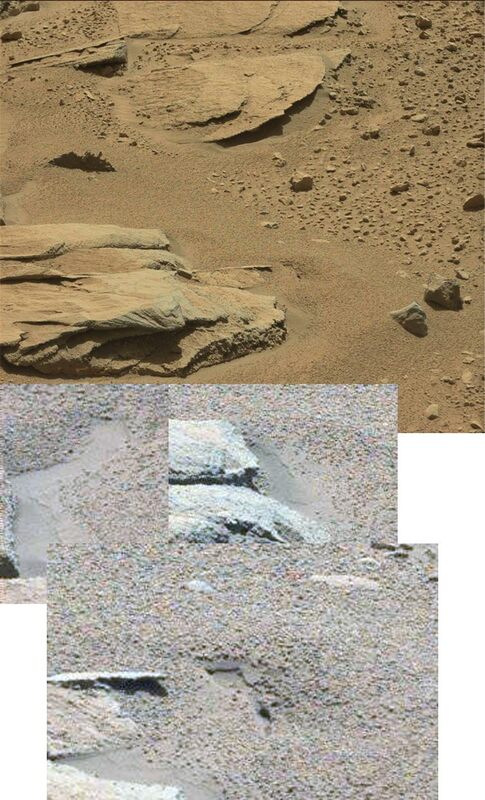 Top - shows the rover, (top, left) but it also shows some boomerang type structure in the middle, that isn't the rover. 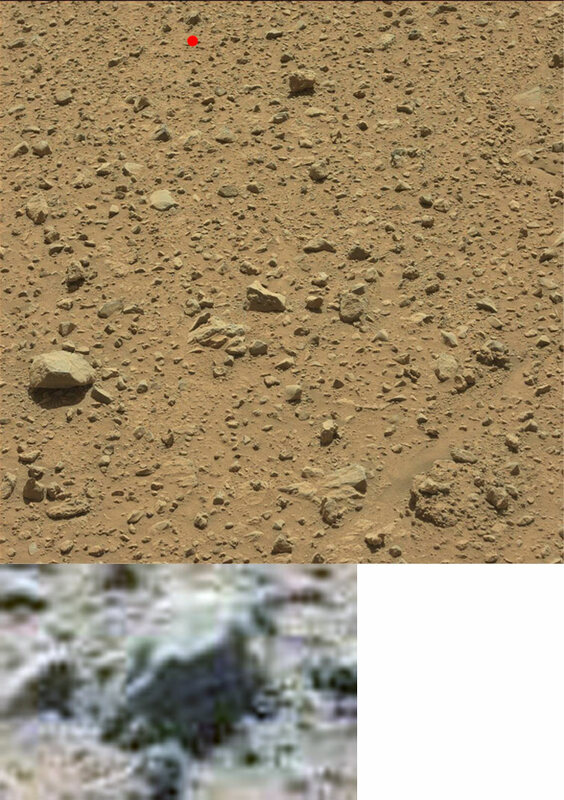 Top - left shows the rover, and a green hill, and a great example of a raincloud. 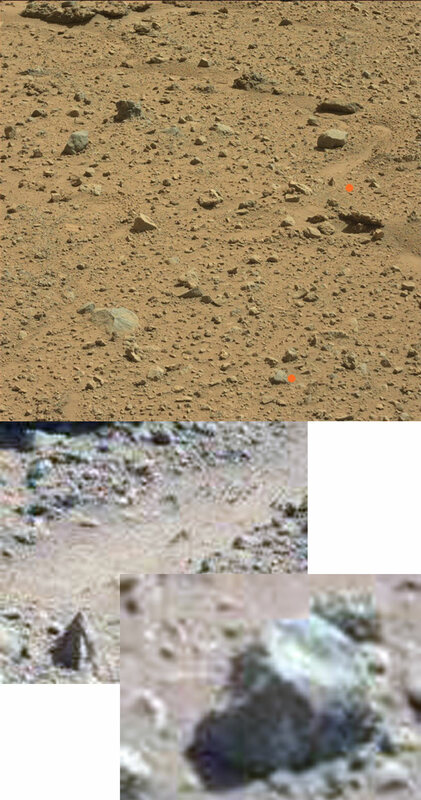 Bottom - the rover appears to be on a path, (yeah, martians don't exist, ignore the path). Top, sun is still settings, and we see the silhouettes of some shrubs, (CP shows green occasionally) but very likely that these are roots holding up plant type structures. 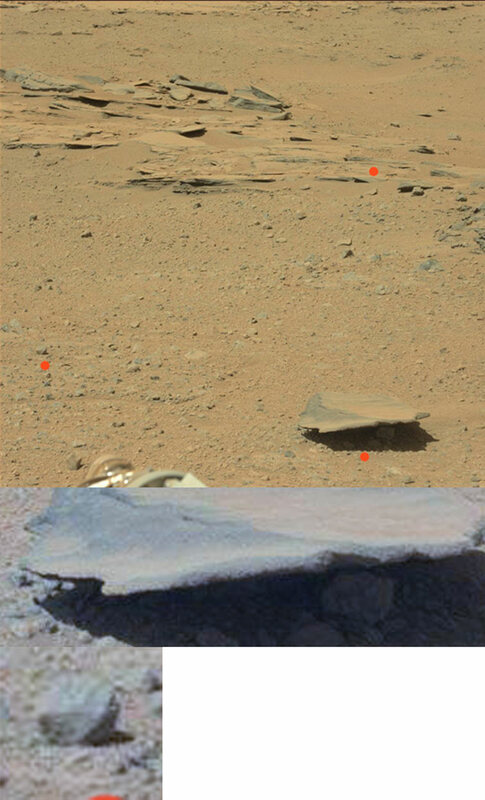 Very unlikely with winds and rain, that thin minerals supporting heavier structures is there. Another one showing the rain bearing type clouds, and some sphere thing, which l will assume is the rover. 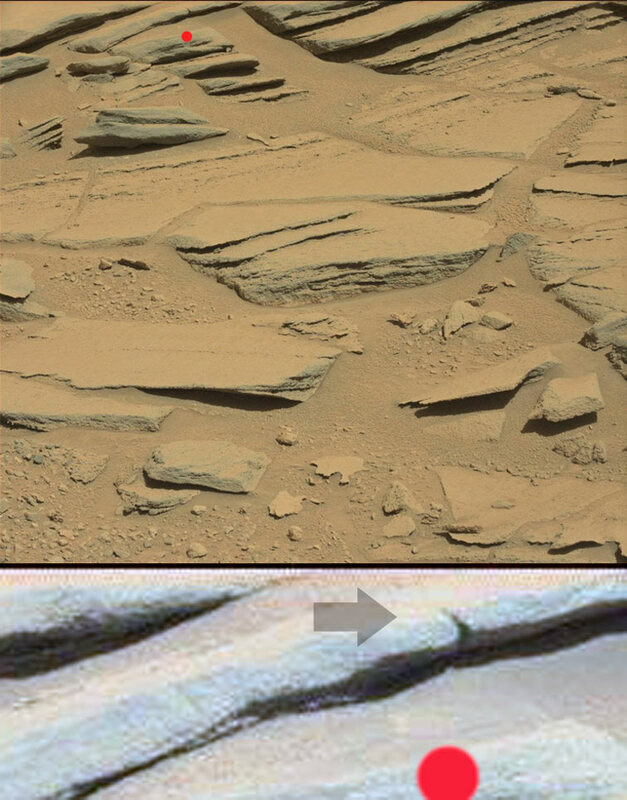 Top one shows the rover trundling alone, what looks like flat ground, which l originally thought was a dry river bed, but a river bed on the top of a slope? Looks like a martian track. Bottom which l thought was a vein of gold, but it is the sun setting, an obvious yellow sun! Next time NASA shows a blue everything sunset, we can all have a good laugh, and also realize that people will buy anything non-confrontational, hopefully 2019 will be more enlightening. New Horizions just whizzed past the Kyper belt object and returned a full color image. No red/orange, (cannot get the red filter to work) BS at all! 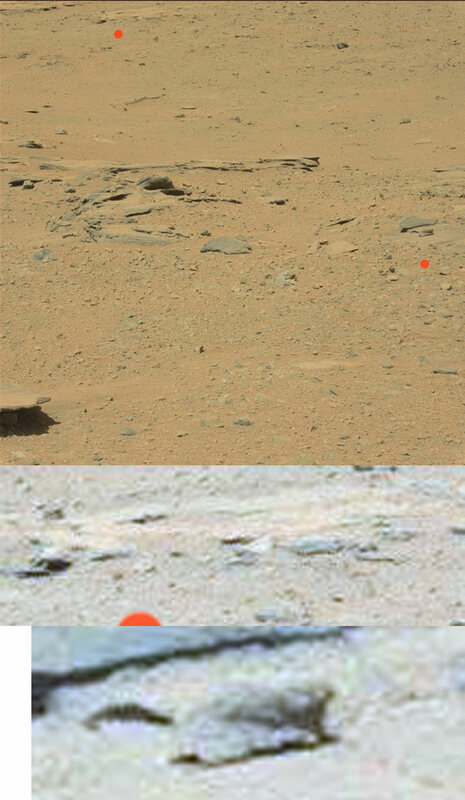 Nope, but go to Mars, and every time, we get this same see spot run issue, (must be the suns angle, or how we are looking at the image, or some seagulls got in the way). Tape a $200 Cannon camera with a 9 month timer up top, and plug it in to the central computer, and l bet we would remove that convenient problem, lol. Hard to make stuff out, but the blue mountains and green are clearly visible. And this one looks like a heel print in the dirt. 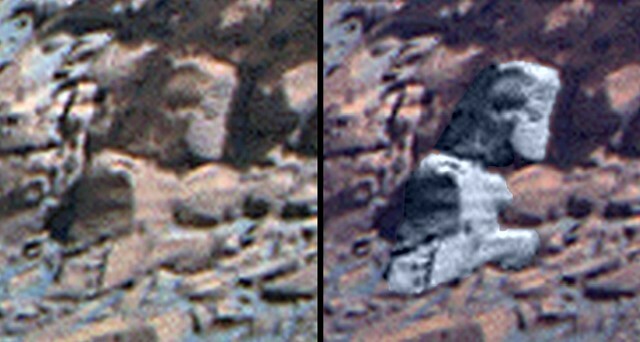 Both large color images show conglomerate rocks which only form under water as its a sedimetentary depositing of materials in the first its in the upper right corner and in the second along the upper more left side edge. With smaller ones in the second in other places. Top - sun still setting over the greenish mountain or hill, with an unmistakable overcast sky, or rain bearing clouds..
Bottom - this possible plant growing out of the rock? 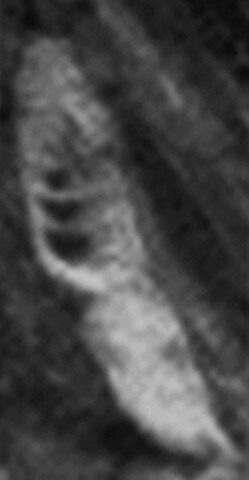 But looking more closely it might also be a gray clenching his hands together, or another totem pole or letterbox, signifying a residence. Another heel print, (probably a reflection, etc). 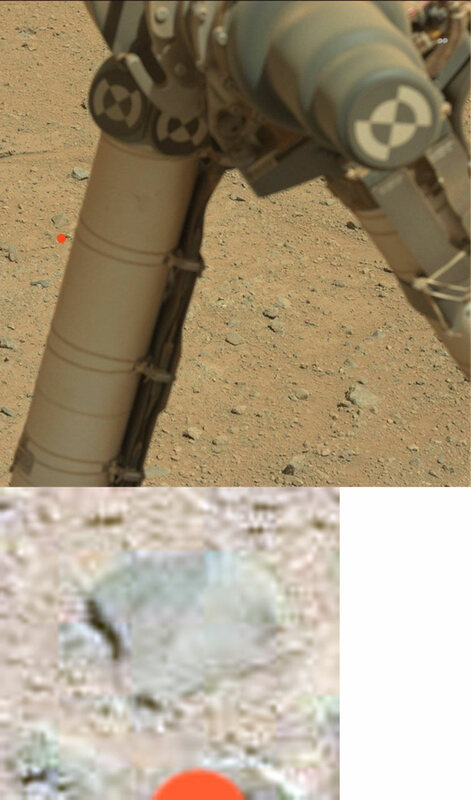 This one that seriously looks like someone's side mirror from a 1950's hot rod, is reflecting back the rovers wheel. 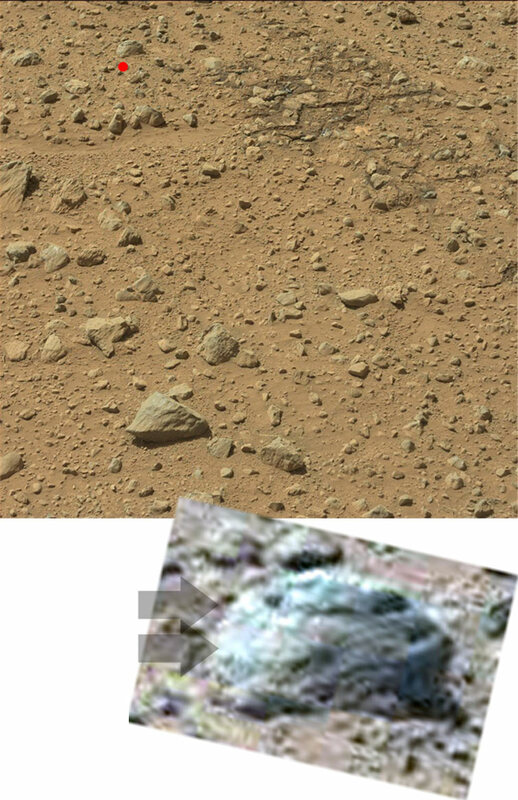 Ok, top image, blue sky, sun still setting some green on the hills and some more stronger green lower down, (grasses or small plants is my guess) with the thing on the right, l am leaning more towards this being a plant than rover, as it has some strong greens. Middle, obvious blue mountains and sky with a strong possibility of rain clouds or potential rain clouds about, and something green on the right or something green being reflected back. 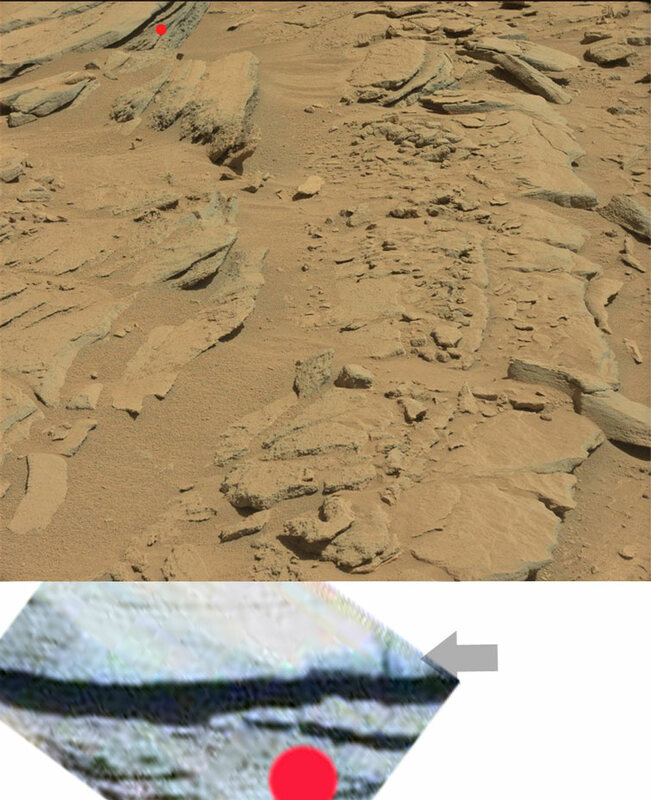 But yeah, Mars definitely has blue type mountains as we do. 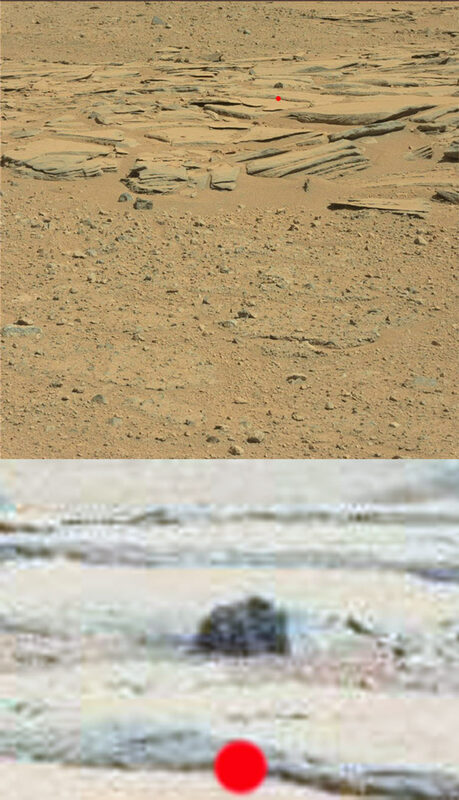 Last, can't tell if the rover is going over a wooden bridge or it is the top of the rover, but considering what l saw before, it is most likely driving along a martian dusty, suburban street, NASA loves irony, and they no doubt love to push human stupidity to see how far it goes. The ground is damp, and there is a possible large water droplet on this section, (well likely, can't be 100% sure not without a before and after image as l previously showed). 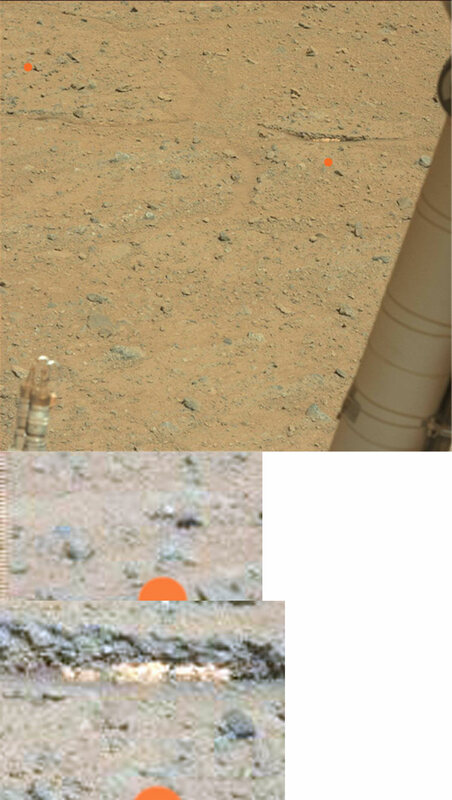 Ok, last one, and a good example of not seeing something and assuming that it is what it initially looks like, (go off and do a video, etc to find that it was a goose-egg). 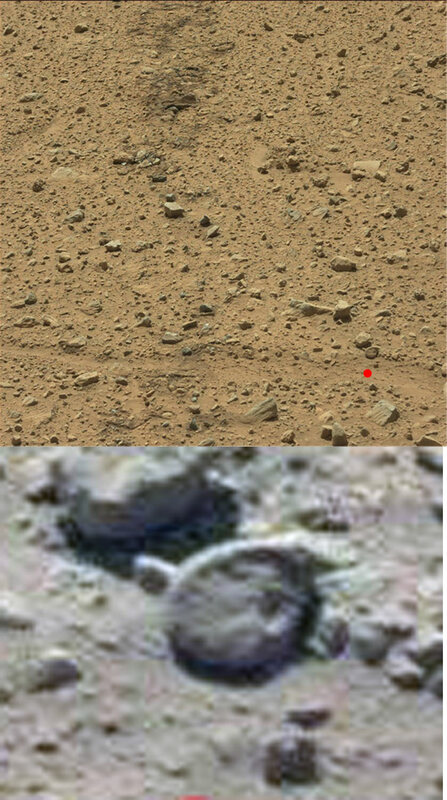 Which this is, it looks like the rover unerthered a ring, but it is a ref, rock, no more. Good image showing some martian rainclouds. 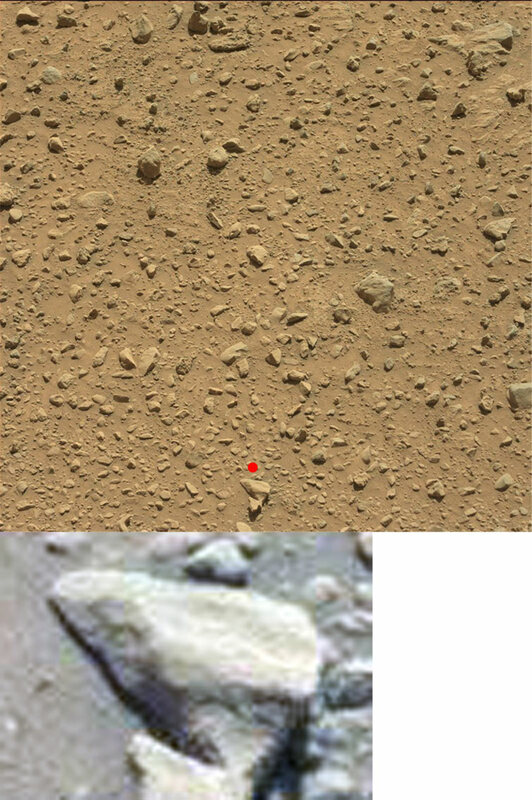 And a reasonably good image showing plants in front of this rock or part of this rock, either way it is not the rover, (rover has No green). 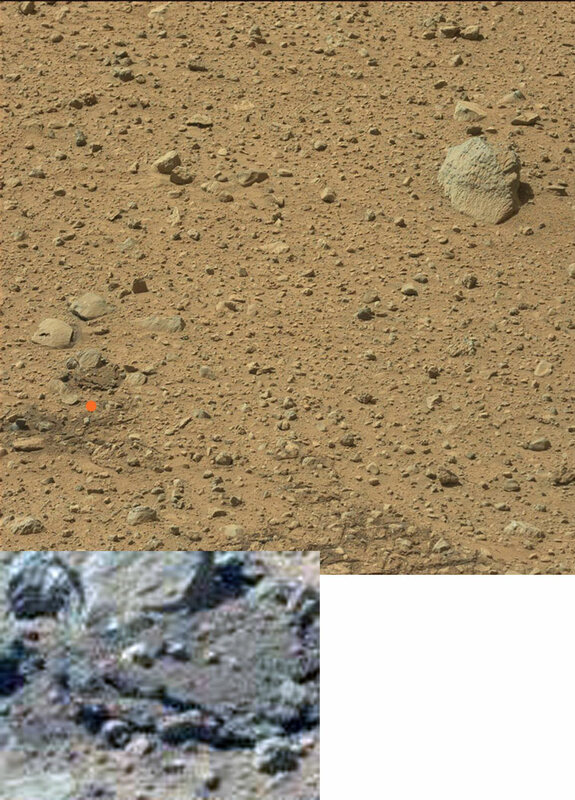 This is one of those images where l can be pretty sure that the white thing and dark thing on top, (arrows) is the rover, front view. The rock and green on the right, isn't. Nothing much today, plants and more plants. Top - this weird thing growing out of the rock, which is most likely a Lichen of some kind. There also appears to be mist or rain, since the background objects are hard to see, but the bottom image tends to show that it isn't light rain, more likely fog or mist. 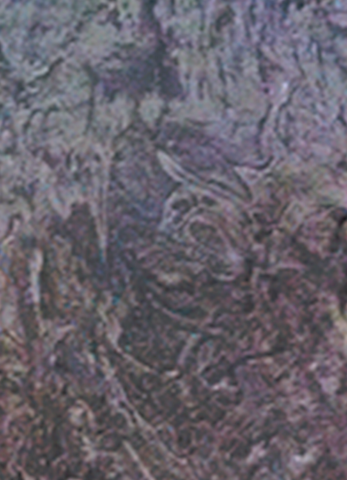 Lower image is also showing plants going into the distance, not ferns, but some kind of probably spiky, drought resistant plant of some kind. I saw these plants before, but dismissed them as something else, or not enough data to be worth posting, but likely a scragely plant with a dry seed pod up top, (similar to our Poppy plants). If NASA allows water drops to get through so we can see them up close on the rover, then they may allow other stuff, (dead bugs, spiders, webs, leaves the list goes on, l will keep my eyes peeled). 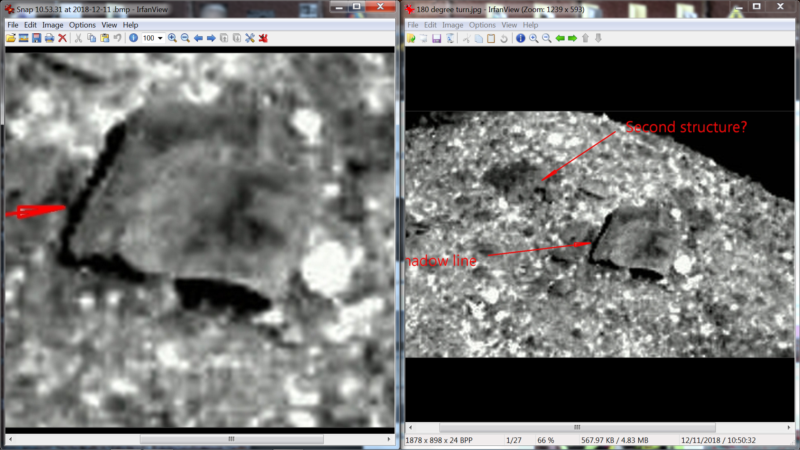 Sun is still setting, and a high likehood that the green exposed root type in in the top/left corner isn't the rover. I still found a martian tree, or its silhouette. CP shows very strong grass to lime green color with almost 100% blue surrounding it, or a slam dunk tree, or plant, (but l like tree more). More likely a tree than anything else going by this different viewpoint. 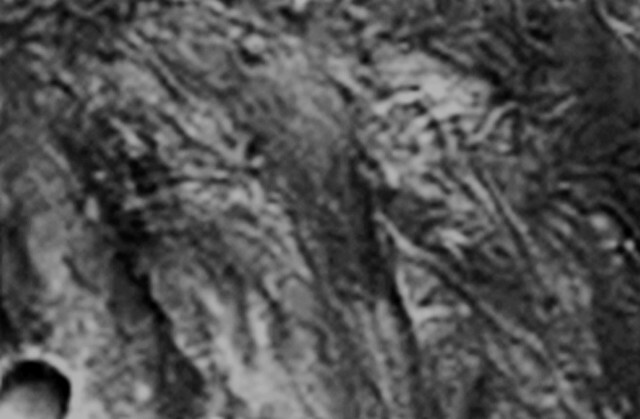 And the surface details are a match for the previous image. Another image that cuts out the cartoon images, (NASA all blue sunsets) and gives us reality. 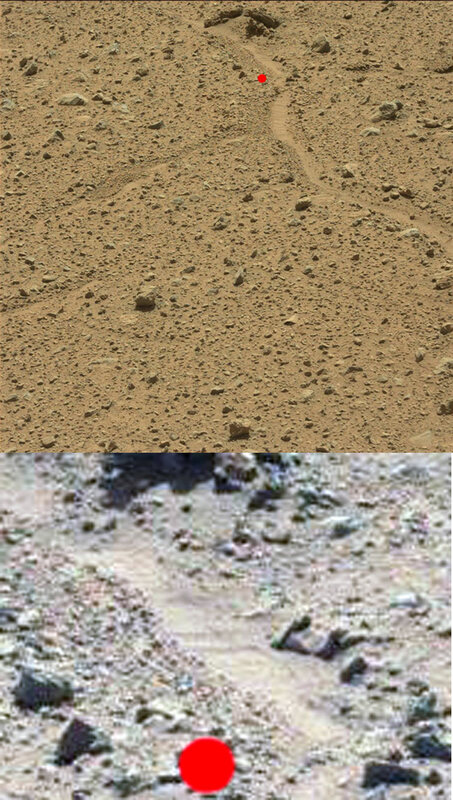 I didn't mark this as it is pretty obvious where l got it from, with the lower image showing obvious damp sand, and the top, (the rovers wheel uncovered some very shiny material) shows the bright sun setting on the left of, (l am assuming that the thing in the middle is the rover). The sun may be 20% less bright than what we get, but it will still be blinding at sunset, common sense. Left - possible petrified bone, right - a plant shadow, CP shows dark, lime green. Plants. 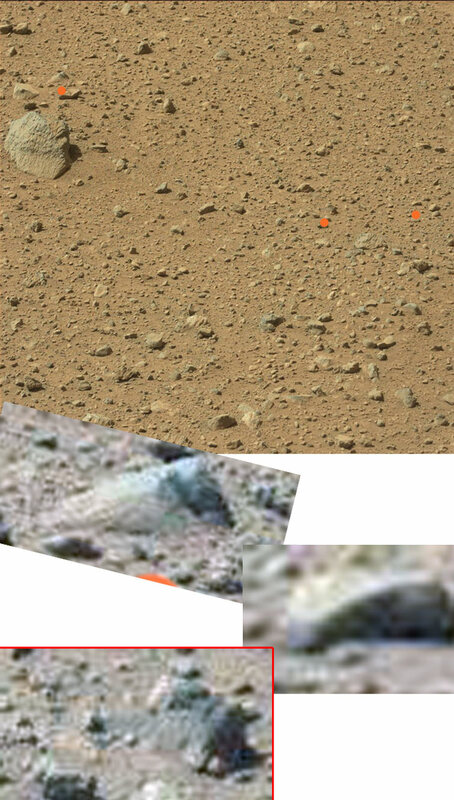 Thing on the left may be the rover, but there is too many wispy objects here, like swamp plants, (and some shows strong green). 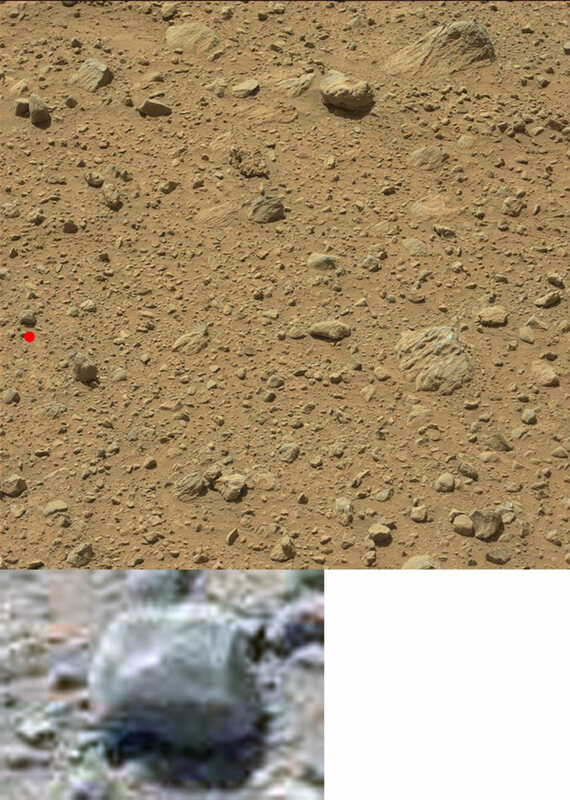 I have been trying to tell myself that this is the rover, but the rover does not have long branches coming out from it. And yep, very likely a recent shower occurred, or the sand is damp. 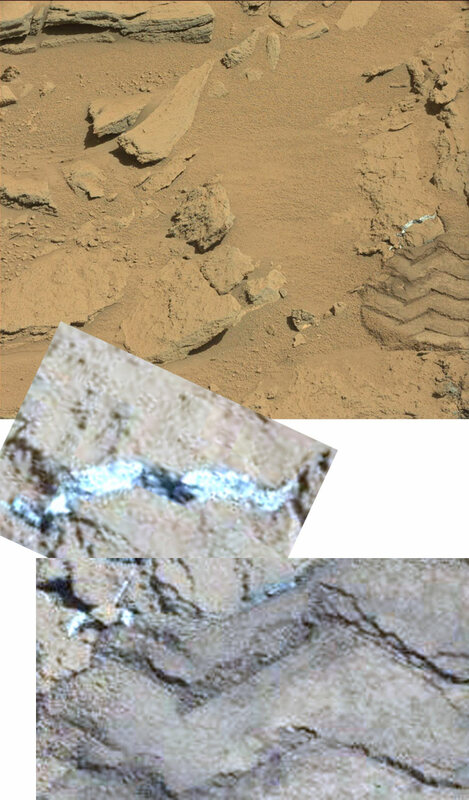 Bottom image is intriguing since it is like the rover drove over it, but it couldn't have, so most likely the recent shower water poured from this spot and caused this impression. It certainly isn't something from half a million years ago, lol.